Like all cultures, Japan has some treasured holiday favorites. The most basic and most important is making mochi. 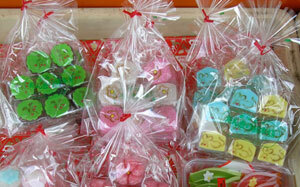 Mochi is made by pounding boiled rice to a smooth elastic paste. 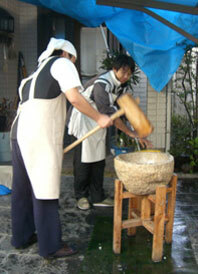 Unlike other forms of food preparation, pounding the rice to a paste was traditionally the husband’s job, like the couple pictured at left pounding home-made mochi in their carport despite the rainy day. It’s not uncommon for social groups or neighborhood associations to turn the task of mochi-making into yet another shared festivity that forms part of the New Year’s preparations. 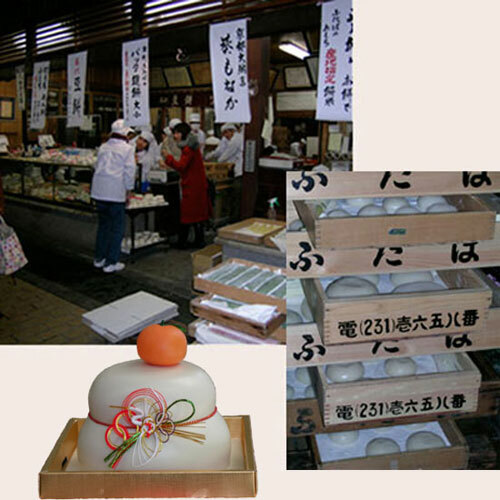 For the less energetic however, mochi can also be bought in shops like the one pictured below. After the rice has been thoroughly pounded, the rice paste is formed into balls of various sizes, dusted with rice flour and left on trays to air dry. For the holidays, two or three large cakes of dried mochi in graduated sizes are stacked up rather like a snowman and topped with a tangerine to form yet another New Year’s decoration that signifies prosperity and thankfulness. Smaller mochi are often added to o-zoni, a sweet New Year’s soup made from red adzuki beans or else they can be toasted till the mochi have turned melty soft and puffy, making a wonderful hot winter treat. 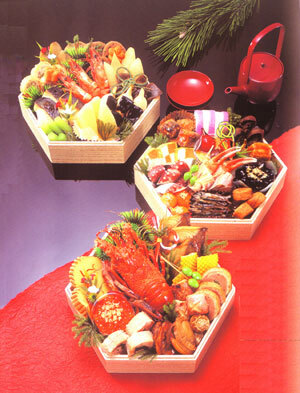 Osechi is New Year’s party food. It can be a wonderfully elaborate visual treat, served in elegant lacquered or porcelain trays. Many of the foods are pickled or preserved and served at room temperature, so that they can be made in advance and allow the hostess to relax with the family and guests during the period of New Year’s entertaining. Traditionally, women did not cook for the first day or two of the new year, but in order to get to that brief period of respite, they are currently engaged in several, several days of pre-New Year’s preparation. And to top it all off, the sweet shops are offerng the most delightful display of New Year’s candies. Those on the far right of the picture are decorated with little mice, the Chinese horoscope sign assigned to 2008. The twelve animal signs also transit through a longer 60-year cycle of elemental associations: Metal, Fire, Wood, Water and Earth. Each of the elements persists for 12 years, that is, one complete cycle of animal years. Being the first in the cycle of twelve signs, the Year of the Mouse is considered a particularly auspicious time for beginning new projects, launching new endeavors. And being the beginning of an earth cycle, those new endeavors are considered destined toward slow but stable growth over many years to come. So good luck to you all in your 2008 ventures, and may you be well prepared to have a Happy New Year! This entry was posted in holidays, Kyoto living on December 30, 2007 by admin. Christmas may be small in Japan, but New Year’s is really big. In fact, it’s HUGE. On Friday, my office closed for the holidays and won’t re-open till January 7th. All over Japan, people are getting ready for a new year and a new beginning. Bonenkai parties (forget-the-old-year parties) have been going on for several weeks now as people repeatedly “wring out” their worries and grievances from the old year while sharing a bottle of sake and assortments of grilled food with their co-workers, friends and neighbors at a seemingly endless parade of parties and gatherings that have spanned the last two weeks. But now as we head to these final few days, preparations are becoming more serious with lot and lots of cleaning and tossing out anythng that’s worn out or broken, since the New Year should be greeted with freshness and cleanliness. 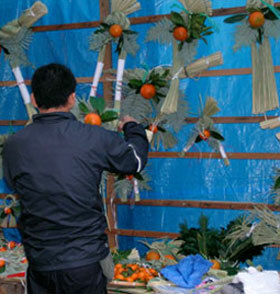 Doorways and entrances receive particular attention and after a good sweeping, are decorated with woven rice straw, bits of greens and tangerines or dried persimmons, like the decorations shown at the shop in the picture above. The rice straw expresses appreciation for the past year’s good harvest (prosperity), green, of course, is a universal symbol of life; and the fruits, both being orange, symbolize gold or good fortune in the year to come. And tiny pine saplings with their roots still attached symbolize the continuing cycle of life and are placed on either side of the entrance gate as a welcome to blessings in the new year. And indoors there are wonderful ikebana. My flower class this weekend focused on holiday decorations. Over steaming cups of green tea, my sensei and fellow students explained the symbolisms involved in the various plant choices. So many of the elements seem so similar to western Christmas decorations, which of course, were borrowed centuries ago from winter solstice celebrations in northern Europe. There is a plant with red berries and green leaves similar to holly but different, the leaves are softer and less pointed. Called senryo, the name means “thousand treasures” and is yet another expression of the wish for prosperity. The chrysanthemums are white for purity. 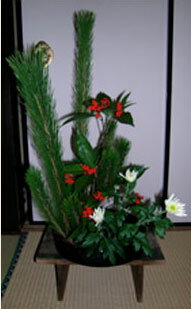 Pine branches symbolize the continuation of life in the midst of winter and it is an ancient Shinto belief that God comes down at midnight on New Year’s Eve to touch the tallest tips of pine trees. 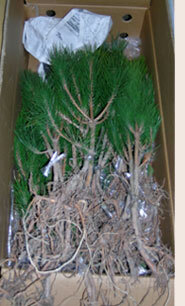 Thus, the pine branch that forms the tallest element in a New Year’s arrangement is considered an invitation to God to enter our homes in the New Year. Is that why we in the west put an angel or the Star of Bethlehem on the tops of our Christmas trees? There is so much self-reflection that comes with exploring the customs of others. Christmas weekend was long and lovely. And though I may not have a Christmas tree, I have the very good fortune of living right next to the largest Christmas tree in Kyoto. 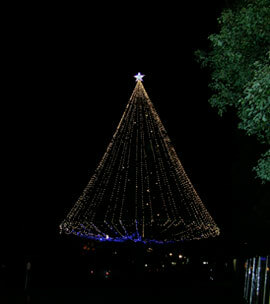 Every year Doshisha University, which hosts the “Center for the Study of Christian Culture”, decorates a positively huge tree in the center of their main campus. It stands a glorious four stories high with beautiful lights that cheer me along as I bike homeward on these blustery winter nights. Not to be outdone, one of my neighbors has put up their own little version of a front yard tree, though such personal displays are rare here, since Japan is a Buddhist country and Christians comprise a minority 2% of the population. Still the most commercial trappings of Christmas have been imported and broadly disseminated. I suppose that’s the way of the world these days: so many things are converted to just another gimmick to keep the cash-flow flowing. All the stores here have Santa Claus displays to encourage the shopper’s spending. And Christmas Cake, a peculiarly Japanese confection of yellow cake, whipped cream and strawberries decorated with tiny Santa Claus figurines, has been sold and consumed all over Japan this week. Some of the restaurants advertise Reindeer steaks for Christmas Eve dinner, which generally causes Westerners here to moan, “Oh no! you don’t understand! Santa needs his reindeer alive tonight.” But such is the skewing of Christmas symbols in a Buddhist country, you just sort of shake your head and smile wryly. For myself and my friends, we have our own traditions of life abroad. 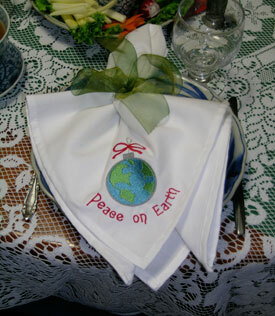 This weekend was the annual Women’s Network Christmas potluck. Last year I started a tradition of embroidering holiday napkins to add a festive touch and everyone gets to take theirs home as a holiday souvenir. I wish I could remember where I got the design. It was one of the many many freebies that I downloaded last year and I’m afraid I can no longer say where it came from. But the message is so true to the spirit of Christmas and I wish it to one and all — no matter which part of the world you live in or what silly things they do with images of Santa or reindeer — Let there be Peace on every corner of our Earth, tonight and throughout the coming year. 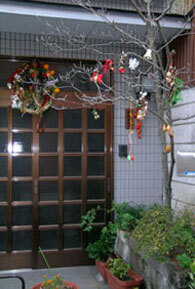 This entry was posted in holidays, Kyoto living on December 25, 2007 by admin. Hard to find blogging time with so much Christmas sewing to do. With a grandson waiting and party goods and decorations to prepare, time at my sewing machine is sweet and the days are swiftly fleeing. 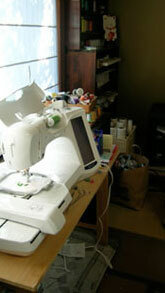 My sewing room looks like a wild woman works there with thread snippits flying to the right and left and stacks of projects everywhere and only a week to finish. Hope everyone is enjoying their Christmas preparations as much as I am enjoying mine. Happy hooping to all and to all some good sewing! This entry was posted in holidays on December 13, 2007 by admin.